For high-volume production, the Integrity system is the right choice. This system is configured for demanding optical, semiconductor and compound semiconductor applications. This solution offers high yield, stress control, high deposition rate, PID control, optimal grain size and film crystallography. Denton offers application-specific tools pre-configured to meet demanding process requirements. 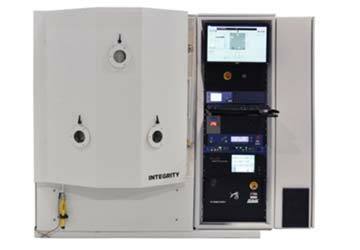 The Integrity’s temperature management system supports a fluid-cooled substrate stage for small grains and textured films, as well as deposition of materials, such as indium, with lower melting points. You’ll also have collimation control of your deposition plume, which eliminates edge effect, optimizes yield, and gives you full control over the angle of incidence for fewer lift off issues. For the greatest process flexibility, an ion source can be integrated for Ion Assisted Deposition or preclean. A wide range of chamber sizes, fixturing options, and pump packages are available to meet your production requirements.